Rated PG. Starring James Franco, Mila Kunis. Directed by Sam Raimi. Out now on DVD and Blu-Ray. How do you make a prequel to one of the most loved films of all-time? How do you recreate the charm, the magic and the theatricality of a true classic? Well, that’s something that Oz the Great and Powerful is up against, and struggles to do. Yep, Disney’s gone back to the Land of Oz. Set in 1905, before the events of The Wizard of Oz, this is a story about a guy called Oz (Franco) who winds up in a land already called Oz to become the Wizard of Oz. But he’s not a wizard, but he is called Oz. Confused? Let me explain. The people of Oz are waiting for a prophecy to be fulfilled – a wizard named Oz will arrive to rule their land as king and save them all. Sound familiar? But as it turns out, Oz is not the wizard they were expecting. There are stacks of gospel parallels in Oz…. The people of the land rejoice that Oz has arrived to save them all, that their promised saviour has finally come. But when they look at him, they admit that he isn’t the wizard they were expecting. In reality, Oz is a phoney. He has to use smoke and mirrors (literally) to convince people he is the wizard they were looking for. Unlike Oz the imposter, Jesus deserves his place on the throne! Technically, there are a lot of problems with the production of this film. While the CGI scenery and landscapes are beautiful, at times it’s too obvious that the acting takes place in front of green screens. The acting isn’t convincing – it’s meant to be 1905 but it feels like Franco and Kunis are just playing dress-ups in 2013. There are references galore to The Wizard of Oz and when they appeared I just felt that I was watching an imitation. I’m sure that kids will love this film, however it’s got nothing on the enchanting original. Watch this with your mates and ask them – is Jesus the real deal or an imposter? 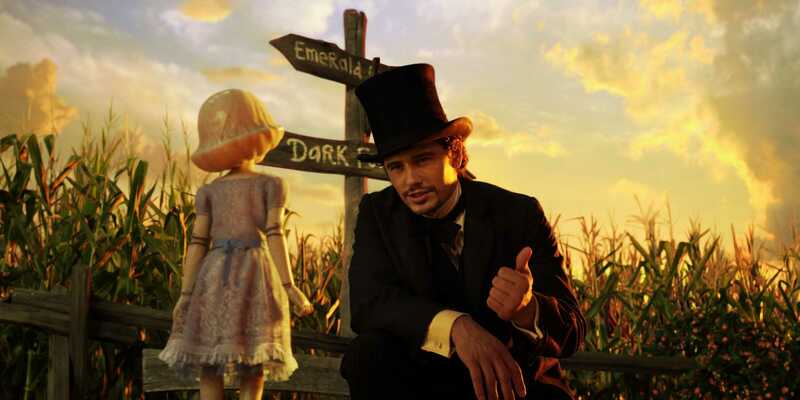 I’m giving Oz the Great and Powerful 3 out of 5 stars. Posted in 2013, Film ReviewsTagged christian, dvd, film review, Jesus, Oz, Oz The Great & Powerful, Oz The Great and Powerful, Reel Gospel, review, The Wizard of OzBookmark the permalink.